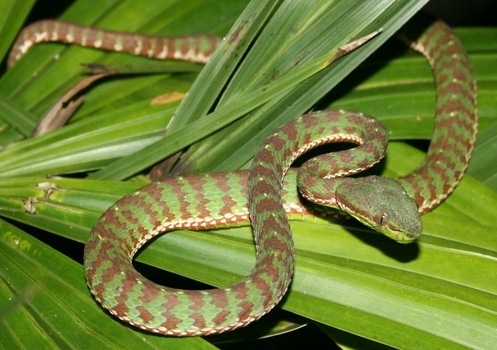 Trimeresurus venustus. 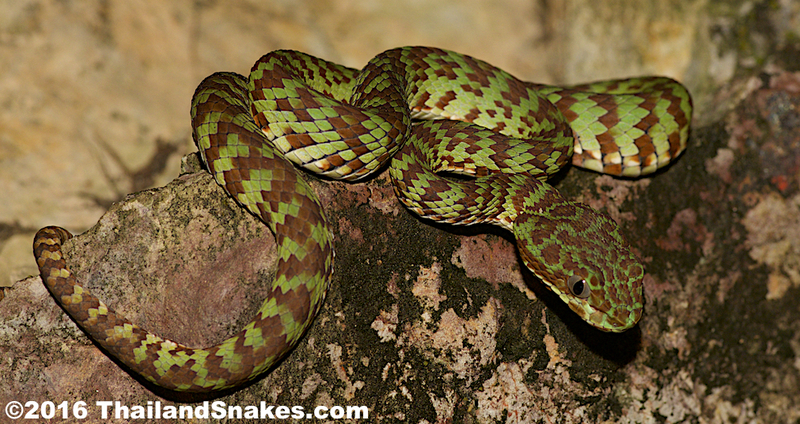 Brown-Spotted Green Viper. Small – 70 cm. Venomous. Mildly Dangerous. Found in Southern Thailand. 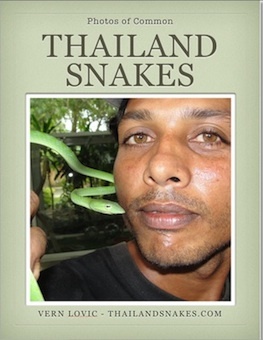 ©2007 ThailandSnakes.com. 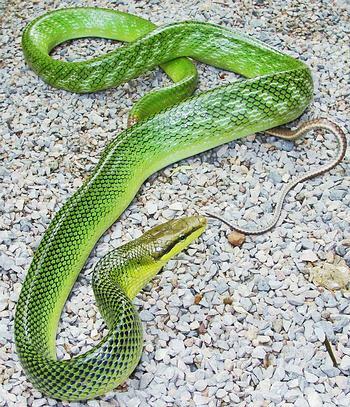 Appearance: Green snake (งูเขียว) with brown or reddish orange scales which may form bands across the width of the snake. Triangular pit viper head. Range: Chumpon to Krabi Province in Thailand. I have found them in Krabi and Surat Thani provinces. Notes: I found this one in the picture on a small hill at a Buddhist temple on a hill next to some steps. These venomous snakes are active on the ground and in bushes. This one was in a bush about 1.3 meters high, right next to the path. It was non-aggressive and didn’t protest when I moved it away from the path with a stick. 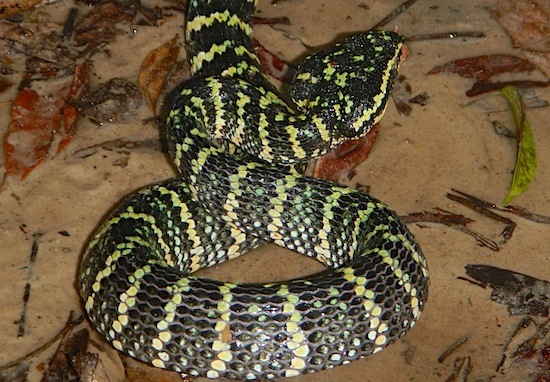 Appearance: Small vipers with usually brilliant greens, whites, and browns. Though sometimes the color can be quite muted. Dorsal scales are strongly keeled. Dorsal scale count 21 – 21 – 15. A brightly colored T. venustus waiting in ambush atop a rock. Habitat: I’ve found these vipers up to 300 meters elevation. This snake hunts almost entirely on the ground where it preys on frogs and lizards. They also enjoy primary and secondary rainforest, limestone mountains, and rubber tree plantations. I kept one of these for three days to photograph and shoot video of. It spends most time suspended from a branch just a few inches off the bottom of the tank. Active Time? The snake is mainly nocturnal. Active during the day only after heavy rainfall. 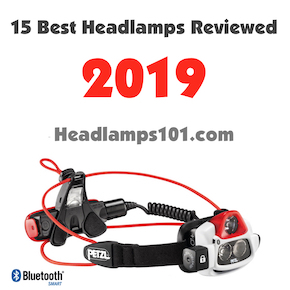 I have found most of mine during daylight hours, but have also found them at night hunting prey on the ground in ambush position in culverts on certain hills. Food: Mice, frogs, lizards. I had a good sized house gecko in the tank with this Trimeresurus venustus, but it left it alone. 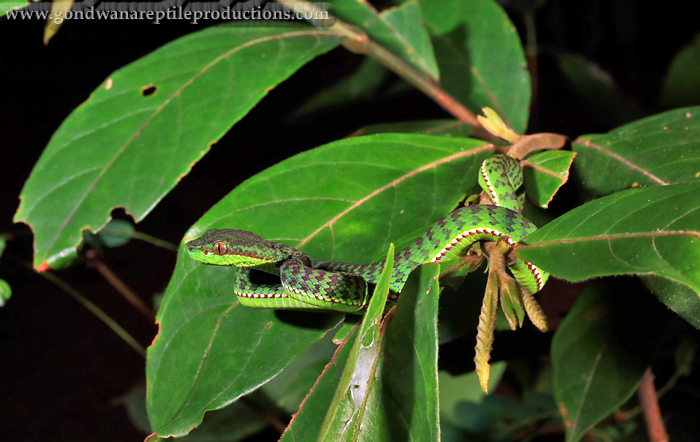 The pit vipers sense the heat of the animal and strike. The geckos are cold blooded so they are no hotter than their surroundings. Still, some pit vipers will eat cold blooded animals. Perhaps this snake just wasn’t hungry at the moment. Defensive Behavior: This pit viper is very slow during the day and only bites if seriously aggravated. I ran into a reptile poacher in a Thailand forest and he was hand carrying one of these brown spotted green pit vipers in his left hand and had a large box turtle in his other hand. I told him – PIT! It means ‘venomous’ in Thai. He insisted “no, it wasn’t” and held it up to his face where the snake immediately bit him on the cheek a couple times and once on the lip. It let go after 1-2 seconds. He said – “See? ?” I promptly bought the snake from him, to keep him from further harm. Not sure what hospital he was at that night! 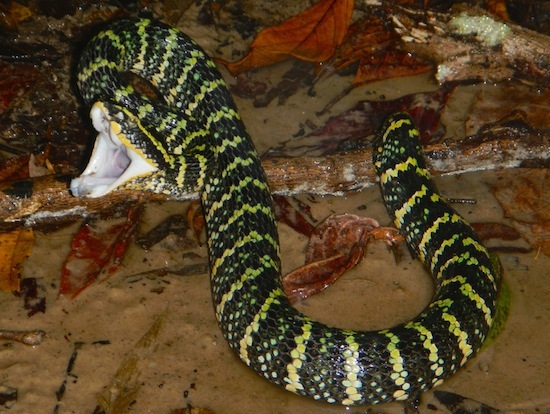 Venom Toxicity: Mildly toxic, but complications can develop. Bites are painful and usually without significant effects. Probably this viper would need to bite down for a number of seconds to transfer enough volume of venom that it would be seriously detrimental, but they are fully capable of doing so. Bites are to be considered potentially deadly. Green Pit Viper Antivenin is available at most public hospitals in Thailand. Offspring: The beautiful pit viper I have now is likely gravid, which contradicts some other info I’ve seen about them having offspring in the June/July time-frame. This is December. She is not overly gravid and looks to be in the beginning stages, but still – I think only a couple of months are required for gestation. She’ll have an early birth – April maybe? These snakes birth live offspring in a jelly-like bubble that breaks after coming out of the female snake. Typical numbers are 20-30 young that are colored and patterned same as the adults. I could find little information about this snake beyond my own experience and some of the snake identification books I have. 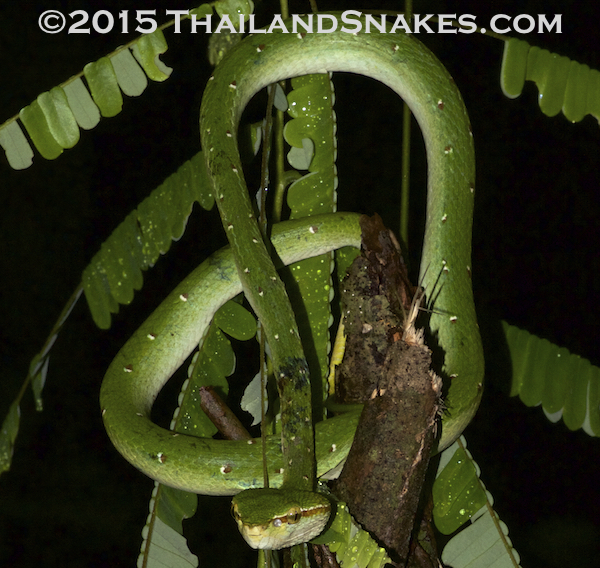 These Red Tailed Racers are beautiful green snakes (งูเขียว) with a grey or reddish tail. They are non-venomous but big enough to give you a strong bite. 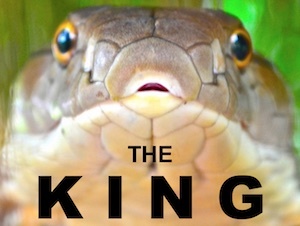 These snakes live for about 15 years on average – if they don’t encounter a predator like the King cobra. Length: Max length about 2.5m (7.5+ feet) They are thick like your wrist and very strong, muscled snakes. Habitat: Red Tailed Racers prefer lowland and up to about 750m above sea level in jungle, agricultural (farmed) land, mangrove forests. They spend most of their time in trees and bushes. 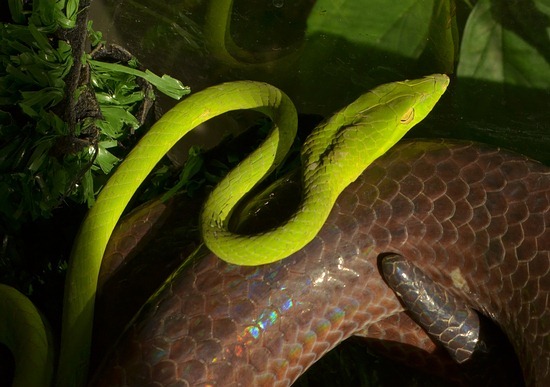 Notes: These are common tree snakes that are also found in caves. They have beautiful greens, with white and black mixed in to their main body color. Their belly scales are rough and ideal for climbing trees. Their top scales are smooth. Identified easily by the dark streak across the eyes, and, if you’re close enough – the blue tongue that flickers in and out when aggravated. The tail is not always or even usually red… the ones I’ve seen are grey. They don’t always do well in captivity and can strike at anytime, though usually much more when aggravated first. 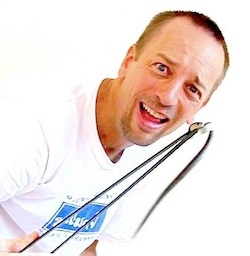 Food: Rats, mice, birds, bats and lizards. Natural Enemies: King cobras love to eat Red Tailed Racer snakes! Defensive Behavior: They flare up their body vertically – not horizontally like the cobras. They puff themselves up vertically and turn this part sideways to you so they can strike fear into you. They do bite when pestered. They can strike from nearly any position, head facing away from you too. Be careful they have strong jaws. Venom Toxicity: No venom dangerous to humans. Offspring: Red tailed racers reach sexually maturity at 4 years. Between September and January this snake deposits small clutches of 3-8 eggs that hatch 45cm long baby red tailed racer snakes in 91 to 112 days. We put this snake on the ground to get a full-body shot, usually it would not be on the ground – they much prefer the trees and bushes. Classified by Boie in 1827. These Golden Tree Snakes are also known as Flying Snakes. They glide very well, perhaps the best of any snake in the world, and even better than some squirrels and lizards. 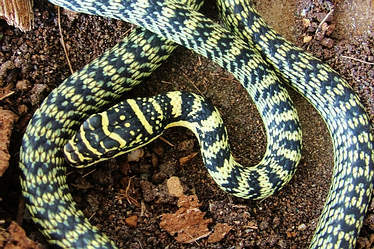 Golden Tree Snakes are a lime green (งูเขียว) and black checkered type patterned snake. They are tree dwellers but can climb anything, even walls. They appear to have a favorite food – the Tokay Geckos that reach sizes of 12 inches long in adulthood. They are frequently seen eating Tokays. 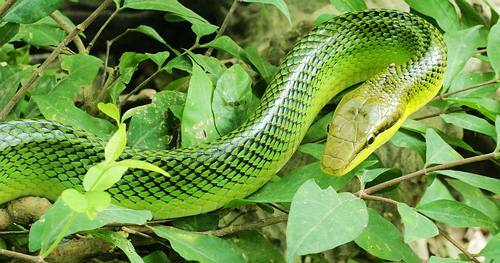 Appearance: Chrysopelea ornata in Thailand is lime green with some black and green cross hatches. 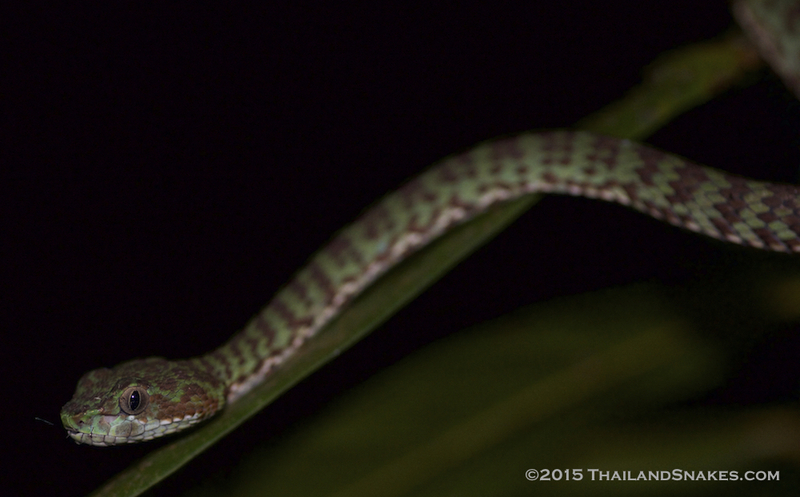 This snake’s head is rather flat with a thin neck and atypical blunt nose, large eyes which sometimes are red depending on the angle. 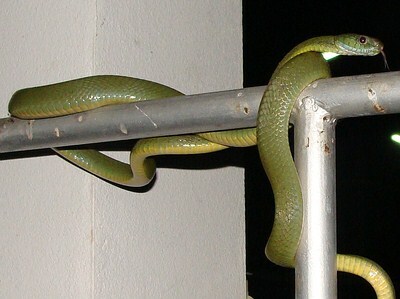 Generally seen as a green snake (งูเขียว) while moving. Length: Up to 140 cm (almost 5 feet). They only get about as thick as 2-3 fingers held together. Range: All over Thailand and many countries in Southeast Asia. Habitat: Golden Tree Snakes can be found just about anywhere – in an apartment in Bangkok, or climbing bushes at 500 meters vertical elevation. Typically I see them at sea-level crossing the roads, or laying flat out along the stem of a low-lying palm tree branch. Notes: If you’re trying to catch one of these snakes it can be very difficult. They are excellent escape artists and once they get into a clump of bushes or up a tree – forget it. Go look for something else, you won’t catch it. They can disappear in trees so fast it’s hard to believe.Occasionally you can find these in caves – they eat bats too. Active Time? Diurnal – daytime. Food: Small geckos, lizards, large Tokay geckos, rodents, bird eggs, insects, another snake occasionally, and bats. Golden Tree Snakes kill by squeezing the neck of their prey, crushing it. Natural Enemies: King cobras and Kraits will eat these snakes when they can catch them. When they are small, birds eat them. 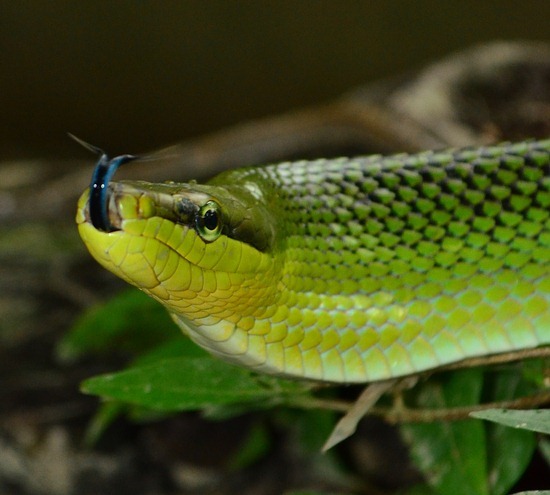 Defensive Behavior: Golden Tree Snakes (flying snakes) bite quickly when played with. As adults they may not lose that temperament. As babies – I have one now for some photos and video, they lose it quickly – and are OK with being held. They are very fast snakes when escaping. Venom Toxicity: Rear fanged mildly venomous snake – but the venom is not known to be dangerous to humans. Just the same, don’t let it bite down on you more than a second or two before you remove it. Don’t give this snake a chance to inject a lot of venom and you’ll likely be just fine if no allergies to it. 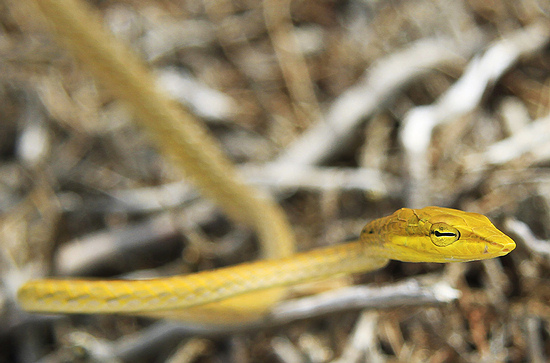 There have been no confirmed cases of medically significant envenomation with Golden Tree Snakes. 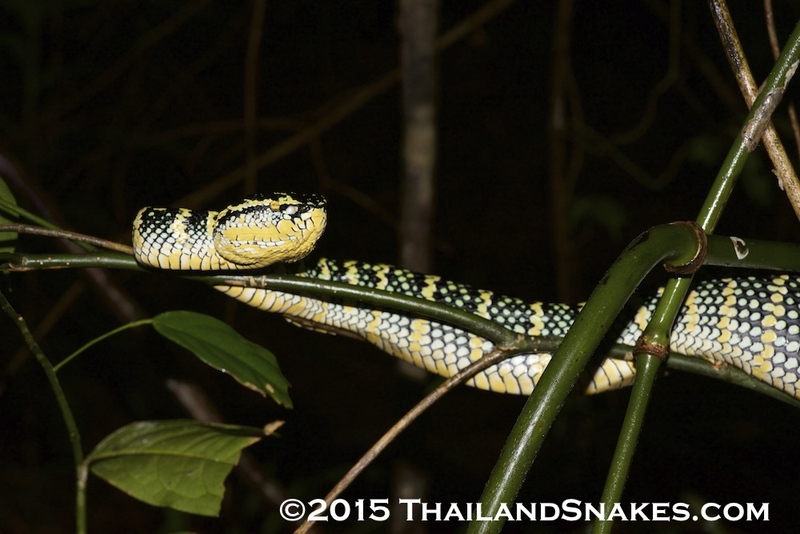 In Thailand the golden tree snakes typically have this coloration and pattern.